Now you can download the DataMasterTM app for all of your mobile devices. The app’s many convenient Read, Record, and Report features make it easier than ever to use your Rapid RH® system for measuring moisture in concrete. 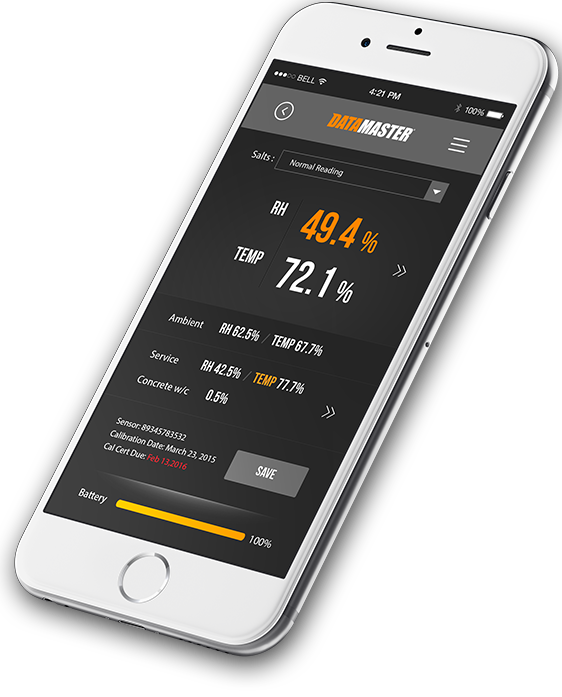 The DataMasterTM app provides you with a seamless relative humidity data collection and reporting system for your iPhone, iPad, iPod Touch, or Android device. Designed specifically for use with the Rapid RH® Bluetooth® Smart Reader and with Rapid RH® Smart Sensors for concrete moisture testing, the DataMaster™ app helps to ensure full ASTM F2170 compliance. Now even better than the original DataMaster™ tool that was awarded Most Innovative Products, Industry Choice, for Concrete Construction Equipment at World of Concrete 2013. You’ll especially appreciate its convenient smartphone interface and report generation. • Acquires ALL data necessary to adhere to the ASTM F2170 standard. • Links all recorded data to a display of your job site’s sensor locations with a new mapping function. • Ensures simple, concise report formatting. • Allows for printing of reports directly from your smartphone to any wireless enabled printer. • Allows data to be easily exported to the dedicated F2170reports.com website for graphing, trending, etc.